U.S. tank rumbles through Baghdad April 6, as Washington’s military forces completed encirclement of Iraqi capital and began repeated raids throughout the city to assert their control. Next day, B-52 bombers dropped four 2,000-lb. bombs on a building where top Iraqi leaders were supposedly meeting. As the Iraqi regime crumbled, the imperialist invaders stepped up efforts to set up a protectorate. U.S. invasion forces have rapidly moved to take control of Baghdad. They entered the outskirts of the Iraqi capital April 4 as battered Republican Guard units crumbled. The U.S. troops then encircled the city and hit key targets to weaken government forces. Over the next three days, U.S. Army and Marine units drove dozens of tanks into the heart of Baghdad repeatedly and began asserting control of the city. As the Militant went to press, U.S. troops had seized the main presidential palace in Baghdad. The same weekend, British forces took control of Basra, Iraq’s second-largest city, which they had placed under partial siege for three weeks. The U.S. and British armies have killed thousands of Iraqi troops in these assaults. At the same time, Washington accelerated preparations to install a military-run occupation regime in Iraq. Paris, Berlin, and other imperialist rivals of Washington, while belatedly jumping on the bandwagon and expressing support for the assault on Iraq, have objected to the plan for a U.S.-dominated protectorate. They fear they will largely be excluded from political and economic influence in the region. Even London, the staunchest ally of the U.S. rulers in this war, has expressed reservations and tried to convince the Bush administration--unsuccessfully--to allow wider latitude for involvement of powers from the European Union in running postwar Iraq. The dispute highlights the driving force behind the assault on Iraq: the conflict between the various imperialist powers over the redivision of the Middle East and control of natural resources in the region--and more broadly in the world. The U.S.-British invasion of Iraq began March 20 with a lightning ground advance toward the capital and an intense bombing of major Iraqi cities. After a week that seemed like a cakewalk, U.S. and British forces met some resistance, having to regroup and send reinforcements to the south. Following another week of strengthening supply lines and suppressing irregular Iraqi government forces in southern cities, the international airport on the western outskirts of Baghdad was captured by U.S. Army and Special Operations troops. Over the previous week, U.S. forces, just 50 miles outside Baghdad, had relentlessly shelled Iraqi Republican Guard divisions entrenched around the city. The guard offered little resistance to the U.S. advance. 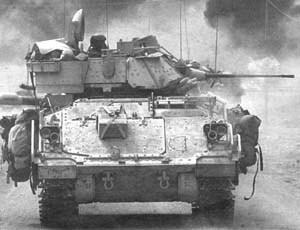 Armored units from the Third Infantry Division rolled rapidly up the final stretch to Baghdad, killing hundreds of Iraqi soldiers who fired small arms at the passing tank columns. One captured soldier from the Medina Division of the Republican Guard told U.S. reporters that Iraqi troops had been subjected to a terrifying bombardment. "When the bombs hit the tanks, many people got in their cars. Then the bombs hit the cars," he said. Iraqi soldiers said that among the bombs dropped by U.S. planes were cluster bombs. In one of the signs of the disintegration of the capitalist regime in Baghdad, stripped-off uniforms and abandoned tanks and artillery littered the roadside. Some residents in the town of Suwayrah--where the Medina Division headquarters had been abandoned--and other points along the way cheered the passing U.S. troops. As the imperialist forces entered Baghdad, tens of thousands of residents fled northward, clogging the roads out of the city for miles. U.S. tank and infantry units seized the Saddam Hussein International Airport after a night of heavy fighting, aiming a political as well as military blow at the regime. Pentagon spokespeople said their troops killed 320 Iraqi troops in heavy artillery attacks and bombings. Doctors at a nearby hospital reported they were swamped with wounded and that dozens in nearby neighborhoods had been killed during the airport battle. Within two days, U.S. transport planes and other military aircraft began landing at this airport. U.S. forces rapidly encircled the capital and established checkpoints on all major routes into the city, making a point of asserting that civilians would not be blocked from coming and going. They began to launch increasingly bolder incursions into the city, while seeking to root out resistance by paramilitary combatants. On April 7, U.S. troops seized several key buildings in downtown Baghdad, including the information ministry and the main presidential palace, where they faced rocket-propelled grenades and small-arms fire from defending troops. Tank units have rolled through downtown areas, to demonstrate to government officials and Baghdad residents "that we can go wherever we want when we want," Capt. Frank Thorp, a Pentagon spokesman, told the media. On April 6, a unit of 25 Abrams tanks and 12 Bradley armored vehicles drove through southwestern Baghdad, killing about 1,000 Iraqi troops, according to U.S. officials. Thorp said the raids were intended to bring down the regime, "not to take ground." Press reports indicate that the invaders have met some resistance from the government’s paramilitary Fedayeen, but little from the demoralized Republican Guard troops. Washington’s objective is to further isolate and shatter the government and the ruling Baathist party apparatus, rather than storm the city. The U.S. invaders are trying to avoid the much higher casualties on both sides a military blitz might lead to, with the political price accompanying such a toll. Overall, the Bush administration has followed a calculated strategy of dealing with the civilian population more carefully than most imperialist armies have done in previous invasions. This is due not to a sudden surge of humanitarian concern on the part of the U.S. rulers. Their goal with this strategy is to minimize opposition to the imposition of a U.S. protectorate that will reinforce Washington’s ability to dominate the region and plunder its resources. In the short term, this approach has been successful. Iraqi government officials reported that as of April 3, a total of 677 civilians had been killed and 5,062 wounded during the first two weeks of the imperialist assault on Iraq. According to Pentagon officials, U.S. forces had fired 750 cruise missiles and 14,000 precision-guided missiles in the first two weeks of the war. Information compiled from dozens of TV and other international media reports indicated that, as of April 8, at least 900 Iraqi civilians and as many as 9,700 Iraqi soldiers had been killed in the assault. Reported U.S. deaths as of the same date amounted to 91 troops, while the British toll was 30 dead soldiers. Some of the U.S. missiles and bombs have hit civilian targets, including a working-class neighborhood and a market in Baghdad on March 26 and 28, respectively, leaving dozens killed and sparking anger among local residents. In other instances, U.S. troops did not hesitate to shoot with heavy weapons at civilian vehicles that did not immediately heed orders to stop at checkpoints, killing a number of unarmed women and children in the process. Nonetheless, it is clear that U.S. officials have been seeking to avoid massive Iraqi civilian casualties--in contrast with the 1990–91 assault, where Washington and London slaughtered at least 150,000 people. Unlike the indiscriminate, sweeping bombings unleashed then, in Baghdad the missiles have mostly been aimed at government buildings and military targets. So far the imperialist forces have not destroyed the capital’s infrastructure, which would lead to a rapid health crisis from lack of electricity and running water. This is both because Washington plans to use existing facilities to help take control of the country, and because it didn’t need to destroy much of Baghdad in order to take it. After two weeks of bombings, U.S. forces knocked out Baghdad’s telephone exchanges as they prepared for the move on the capital. Journalists visiting the sites noted that "in almost every case the missiles or bombs used appeared to have struck bull’s-eyes in the roofs" and plunged straight down into the buildings, New York Times reporter John Burns wrote. "The striking thing, in these cases, was that even Iraqi officials made no claim of deaths," he noted, adding that the surrounding neighborhoods had mostly been abandoned days before. The efforts to seize Baghdad without storming it are "similar to those in the southern city of Basra, where the British continue to nibble away at the defenses there, to target the elements still loyal to Saddam Hussein where they can; to use a lot of psychological operations and propaganda," a British Broadcasting Corporation (BBC) reporter noted April 4. Three days later, British forces reportedly held most of the city, and Iraqi leader Ali Hassan al-Majid was found dead at his home there. He is the general accused by the imperialist invading forces of having ordered Baghdad’s assault on rebelling Kurds in Halabja, northern Iraq, in 1988. Some 5,000 Kurds died in that attack, and 10,000 were seriously affected, when Iraqi jets dropped chemical bombs. At that time, Washington still had good relations with Baghdad and didn’t lift a finger to come to the aid of the Kurdish people. Special Forces have operated inside Basra to seek the collaboration of bourgeois forces opposed to the Iraqi regime. "In Basra," the BBC reporter added, "the city remains to a certain extent quite open--with civilians free to move in and out" while the imperialist military targets the government’s paramilitary troops. The imperialist armies have been going out of their way to appear concerned about the "humanitarian" situation. In southern cities, where the fighting between the invading forces and the regime’s paramilitary combatants has led to critical conditions for the civilian population, U.S. and British troops have made demonstrative moves to offer residents water and food. The regime’s heavy-handed propaganda has tended to backfire on it. Surrendering Republican Guards were surprised at how they were treated. "Some told their interrogators they had been told by leaders of Saddam Hussein’s Baath Party that Americans would burn and pillage Iraq and take no prisoners," AP correspondent David Espo reported. Washington’s successes on the Iraqi battlefield pushed back the carping by retired generals and liberal critics of the Bush administration’s military strategy, vindicating the approach that U.S. defense secretary Donald Rumsfeld has most forcefully advocated. The "Rumsfeld Doctrine" calls for Washington using smaller, faster-moving military units that rely heavily on special forces and weapons technology, and are willing to take more risks in the field. The critics had complained that the U.S. ground force was not large enough, was facing stiffer-than-expected Iraqi resistance, and had become stretched. The resistance in southern Iraqi cities, however, while not expected by U.S. officials, was limited largely to guerrilla harassment by the regime’s paramilitary forces. There has been no evidence of massive popular resistance, despite the anger of many working people at the hundreds of civilian deaths and thousands of serious injuries caused by U.S.-British bombings, and at the severe hardships caused by the past 12 years of imperialist economic sanctions. The Saddam Hussein regime, far from organizing and mobilizing working people, relegated them to the sidelines. It resorted to brutal coercion as well as exhortations and false claims such as the supposed arrival of 4,000 Muslim volunteers from other countries to conduct "suicide" attacks. It placed salvation largely in the hands of the Republican Guard and its rotted-out officer corps. In the second week of the war, the U.S. and British military were able to redirect some of their troops to attack the Fedayeen militia, while continuing to target the Baathist party apparatus. By the following week, U.S. forces were entering Baghdad. Defenders of the Rumsfeld approach skewered the critics and their warning of a supposedly flawed military plan. "With American troops at the gates of Baghdad, the plan is looking pretty good now," wrote columnist Charles Krauthammer April 4. He made fun of how R.W. Apple, the New York Times’s longtime military "expert," had been quick to predict a "quagmire." Liberal Times writer William Keller acknowledged after the fact that the Bush administration’s course was "impressive: a well-considered strategy, adaptable to the unexpected turns of war and accomplished, so far, with remarkably low U.S. casualties and far, far fewer civilian deaths than the alarmists predicted." Apple himself turned on a dime and praised the Bush administration strategy, saying the U.S. troops who had taken the Baghdad airport "arrived there faster than either critics or supporters of the war imagined that they could" and that "the vaunted Republican Guard has proved to be a washout for the second war in a row." Brig. Gen. Vincent Brooks, the 44-year-old Central Command officer who gives the daily press briefings on the war, won praise in the big-business media for not having lost his cool in face of hostile and often ignorant questions from liberal journalists. Meanwhile, Washington has continued its main propaganda themes to rally public opinion behind the war. One is the claim that the Hussein regime stockpiled chemical and biological weapons that posed a threat to the United States. Despite dire predictions, Iraqi forces have not used chemical arms against the invading armies. Previous U.S. claims over the past two weeks--allegedly finding hidden chemical weapons facilities or Iraqi soldiers wearing anti-chemical weapons gear--have generally made headlines in the capitalist media for a day or two and then faded. On April 7, U.S. officials claimed they found evidence of chemical weapons at what they called a military training camp in central Iraq. The U.S. rulers have also intensified their patriotic campaign to "support our troops." The campaign to display yellow ribbons has expanded, as the government and big-business media have played up the rescue of a captured U.S. soldier, Pfc. Jessica Lynch, as well as the funerals for GIs who have died during the invasion. The press has highlighted the deaths of a few soldiers who were women, Black, or Native American. Before Washington and London launched the war, their imperialist rivals in Paris and Berlin, as well as the regime in Moscow, had argued for extending the United Nations "arms inspections" in Iraq and getting a UN stamp of approval as a way of legitimizing the assault on that Middle Eastern nation. The U.S. and British governments dismissed these proposals and launched the offensive. Now that the invasion is well-advanced, their rivals have declared their support for the war, maneuvering to try to ensure themselves a place at the postwar trough. "I think it is absolutely natural," said French foreign minister Dominique de Villepin at an April 4 news conference, endorsing the Anglo-American invasion, "that in the security phase, the forces on the ground have a specific responsibility." German chancellor Gerhard Schröder, echoed by Russian president Vladimir Putin, has called for a quick victory for the occupying forces. To counter the move to set up a U.S.-dominated occupation regime in Iraq, however, the French and German governments have called for a major UN role. "Nobody can hope to build peace alone," de Villepin lectured. The White House has rejected this demand. U.S. national security advisor Condoleeza Rice said April 4 that "the coalition intends to have a leading role...the leading role," referring to Washington and London. She said the United Nations might have a secondary role "where its expertise makes sense." De Villepin also objected to plans to award most "reconstruction" contracts to U.S. companies. "The idea that Iraq can be an El Dorado, a cake that states can cut up and share doesn’t appear to me to be good sense," he huffed. The same day, the U.S. House of Representatives approved a proposal to bar companies based in France, Germany, Russia, China, and Syria--whose governments opposed a U.S.-sponsored war resolution before the UN Security Council--from U.S. government contracts to rebuild Iraq after the war. The Senate has avoided a vote on the controversial issue thus far. London, too, is concerned that, while a "coalition partner," it may not get much of the Iraqi gateau. British prime minister Anthony Blair has also called for a more central UN role in the future occupation regime. British officials said Blair would raise his proposals at his April 7–8 war council with Bush in Belfast, northern Ireland. Washington also taught Moscow a lesson, and U.S. government officials have threatened the Syrian government it may be next on their hit list. Vladimir Titorenko, Russia’s ambassador to Iraq, arrived April 7 in Damascus, Syria’s capital, in a diplomatic convoy that he said had come under fire from U.S. forces besieging Baghdad, injuring five people. "After leaving Baghdad," Titorenko told reporters near the Iraqi-Syrian border, "we faced a number of American armored vehicles, tanks, and guns." He added that the convoy stopped when they saw military vehicles. "There was shooting [at us], and some hand grenades were thrown at other vehicles," he stated. "We tried to warn them, but they fired at us directly, and the shooting continued for about 40 minutes." A spokesman for Moscow’s foreign ministry said five Russian diplomats were injured in the April 6 assault. Titorenko, who drove his own car to Syria, said his driver had been left in Iraq to be treated for "serious injuries" he sustained in the attack. The U.S. Army initially claimed it had no troops in the Baghdad suburb where the incident took place. A Russian TV correspondent who had been in the convoy said it was caught in a crossfire between U.S. and Iraqi forces. In Moscow, a senior U.S. diplomat later said the incident had occurred in an area where U.S. forces were active. On April 8, with Moscow’s relations with Washington hitting a new low, Russian defense minister Sergei Ivanov canceled his visit to the United States, which had been scheduled for April 13. Two days earlier, U.S. deputy defense secretary Paul Wolfowitz threatened the Syrian government over its support for the Iraqi regime. "There’s got to be a change in Syria," Wolfowitz said on NBC’s "Meet the Press" TV show April 6. Washington had warned Damascus earlier to stop sending war materiel to the Iraqi army and close its border to Muslim militants who were already traveling from Syria to Iraq to join the fight against the U.S.-led invasion. "The Syrians need to know," Wolfowitz emphasized, "they’ll be held accountable." The U.S. official continued, "I think a lot of countries, including Syria, will eventually get the message from this [Iraq war] that it’s much better to come to terms peacefully with the international community, to not acquire these weapons of mass destruction, to not use terrorism as an instrument of national policy." James Woolsey, a former CIA director who has been considered for a post in the U.S. group that will install a new regime in Iraq, told an audience at the University of California in Los Angeles (UCLA) April 2 that the "fascist" government in Syria has to be replaced. Meanwhile, moves are apace to establish a protectorate in Iraq that will be run directly by the Pentagon. The White House is reportedly preparing to announce retired general Jay Gardner as its "civilian administrator" for the so-called Iraqi Interim Authority, which Rice described as "a repository of sovereignty" for that nation. Wolfowitz stated April 6 that such a regime would last more than six months before Washington would consider turning it over to Iraqi figures. Lt. Gen. Thomas Franks, commander of the U.S.-led forces assaulting Iraq, is set to be the supreme military authority of the occupation regime. Franks visited U.S. troops fighting in the Iraqi battlefield for the first time April 7. Washington is planning to use exiled Iraqi bourgeois opposition leaders as figureheads in such a regime. Ahmad Chalabi, head of the U.S.-funded Iraqi National Congress, was secretly flown by the U.S. military to southern Iraq as part of these moves. Chalabi has not set foot in Iraq for 45 years, having departed in 1958, after the July revolution that brought down the imperialist-backed monarchy and five years before the reactionary coup that brought the Baathist party to power. Some Iraqi exiles have called for the country to be opened to international oil companies as quickly as possible. "The move could spell a windfall for big oil companies such as ExxonMobil, Royal Dutch /Shell, BP and TotalFinaElf and oil service companies such as Halliburton and Schlumberger and would strain the OPEC oil cartel’s attempt to keep oil prices high," the Financial Times reported April 7. The London daily reported that U.S. plans call for the Iraqi protectorate to "remain a member of OPEC but be exempt from quota restrictions."